Cocaine has been known to inhibit dopaminergic and serotonergic systems. Here, we aimed to study the addictive effects of cocaine on both systems of rats after chronic treatments. 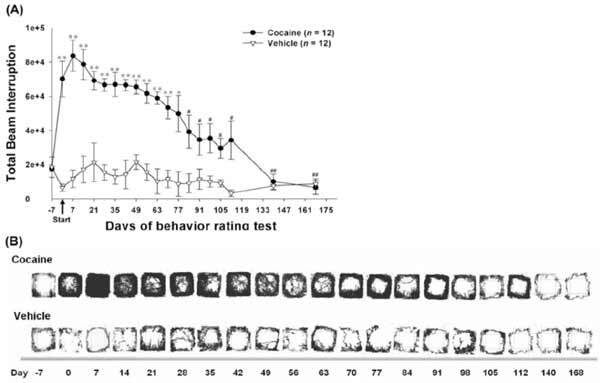 Rats were treated with vehicle or cocaine for four months, and the changes of behavior and expressions and activity of dopaminergic and serotonergic systems were assessed. Locomotion was used to estimate the animal behavior. The neuronal imaging of dopamine D2 receptor (D2R) with [11C]raclo- [11C]raclopride/microPET and serotonin transporter (SERT) with [123I]-2-((2-((dimethylamino) methyl) phenyl) thio)-5- iodophenylamine ([123I]ADAM)/gamma scintigraphy was performed for determining the specific striatum/midbrain binding ratios. Animal Magnetic Resonance Imaging (MRI) and immunohistochemistry (IHC) were applied to assess the anatomical changes in the rat brains. The activated locomotion was found for the first ten weeks, and gradually recovered to the baseline. Brain D2R imaging (i.e., [11C]raclopride/microPET) showed the decreased ratio of striatum/midbrain during the study and two weeks post the withdrawal of cocaine treatments. Brain SERT imaging (i.e., [123I]ADAM/gamma scintigraphy) was also found similar to the declined ratio of midbrain/cerebellum. However, animal MRI did not find brain hemorrhage and edema. Notably, the results obtained from IHC showed serious neuronal damage with decreased Tyrosine Hydroxylase (TH)-positive and increased glial fibrillary acidic protein (GFAP)-positive expressions in the critical brain regions. These results demonstrate that the predominant effect of chronic cocaine treatments on the dopaminergic system is more severe than on the serotonergic system as evaluated with the behavioral tolerance, D2R impairment, and dopamine neuron deficit. Keywords: [11C]raclopride, [123I]ADAM, dopamine D2 receptor, glial fibrillary acidic protein, serotonin transporter, tyrosine hydroxylase. Affiliation:Department of Biomedical Imaging and Radiological Sciences, National Yang-Ming University, No.155, Sec.2, Li-Nong St., Beitou, Taipei 112, Taiwan. Keywords:[11C]raclopride, [123I]ADAM, dopamine D2 receptor, glial fibrillary acidic protein, serotonin transporter, tyrosine hydroxylase. Abstract:Cocaine has been known to inhibit dopaminergic and serotonergic systems. Here, we aimed to study the addictive effects of cocaine on both systems of rats after chronic treatments. Rats were treated with vehicle or cocaine for four months, and the changes of behavior and expressions and activity of dopaminergic and serotonergic systems were assessed. Locomotion was used to estimate the animal behavior. The neuronal imaging of dopamine D2 receptor (D2R) with [11C]raclo- [11C]raclopride/microPET and serotonin transporter (SERT) with [123I]-2-((2-((dimethylamino) methyl) phenyl) thio)-5- iodophenylamine ([123I]ADAM)/gamma scintigraphy was performed for determining the specific striatum/midbrain binding ratios. Animal Magnetic Resonance Imaging (MRI) and immunohistochemistry (IHC) were applied to assess the anatomical changes in the rat brains. The activated locomotion was found for the first ten weeks, and gradually recovered to the baseline. Brain D2R imaging (i.e., [11C]raclopride/microPET) showed the decreased ratio of striatum/midbrain during the study and two weeks post the withdrawal of cocaine treatments. Brain SERT imaging (i.e., [123I]ADAM/gamma scintigraphy) was also found similar to the declined ratio of midbrain/cerebellum. However, animal MRI did not find brain hemorrhage and edema. Notably, the results obtained from IHC showed serious neuronal damage with decreased Tyrosine Hydroxylase (TH)-positive and increased glial fibrillary acidic protein (GFAP)-positive expressions in the critical brain regions. These results demonstrate that the predominant effect of chronic cocaine treatments on the dopaminergic system is more severe than on the serotonergic system as evaluated with the behavioral tolerance, D2R impairment, and dopamine neuron deficit.